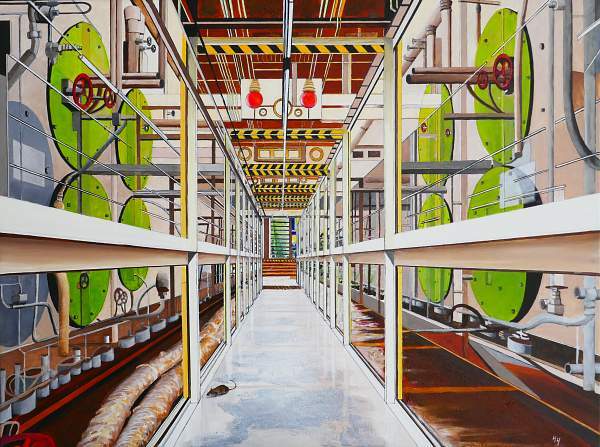 In this oil painting Bert has painted the central gangway of the engine room of the SS Rotterdam. Bert is now working as a volunteer shiphost one morning a week on this former cruiseship. In 1966, in between his secondary school and the military service, he has sailed on the ship and worked there as a hut steward and later as 'commis' in the restaurant La Fontaine. The SS ROTTERDAM (38,645 GRT) is the largest passenger ship ever built in the Netherlands to be equipped with Parsons turbines. The ROTTERDAM was one of the largest examples of the generation of passenger ships designed to make line voyages. In the 1960’s, the ship ranked among the world’s top ten liners. At this time, there are only about eight, mostly smaller, ships with Parsons turbines still sailing. Bert painted a rat in his painting. For sailors and boatmen rats are a nightmare. As good swimmers and climbers they get on board over the mooring lines. Once on the ship, they can cause immense and costly damage in a very short time. And a well-known saying is: "When the water reaches the upper level, follow the rats."